Every springtime I anticipate my clients coming to see me with gardening-related muscle strains and familiar tension and pain patterns from over-doing it on yardwork and planting. 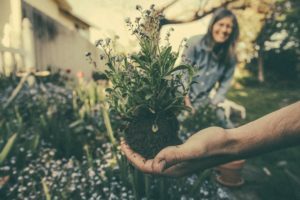 With unpredictable weather in Seattle and the Pacific Northwest in general, it’s not uncommon to do sporadic bursts of high intensity landscaping, weeding, digging, planting, and moving heavy pots and yard waste bags around. Just thinking about it makes my low back ache! So here are nine ways to prevent pain and tension from accumulating in your body so you can enjoy this beautiful weather to the fullest. Get the gear – Make sure you have what you need before you start working. You may need a garden pad to protect your knees while kneeling, or knee pads if you prefer. A low stool can help as well if kneeling isn’t a comfortable option for you. A wide brimmed hat will protect your face from sunburn, and remember to apply sunblock as it’s easy to underestimate the time you will be outside. I like wearing my crocs in the garden because it’s easy to rise them off after I’m done gardening. Stretch before, during, and after – I can’t say this enough, if you want to get stronger muscles and prevent injury, then even short periods of stretching can help! Gardening is great exercise, but because it is a sporadic activity for most of us, it can take more of a toll on our bodies than we think, so protect your muscles and joints and stretch! Stretch your hips, psoas (deep hip flexors), low back, thighs, and shoulder muscles intermittently while you work, and you will recover much faster from gardening. Take frequent breaks – Take breaks to stretch, hydrate, use the restroom, don’t just power through in discomfort. You will actually be more productive and have more energy. Set an alert on your phone for every half hour or twenty minutes and take a break when you hear it, don’t just ignore it. Set another alert for when you want to stop, but don’t make your gardening time five hours, when was the last time you did a five hour workout? Take into account your usual level of physical activity and adjust accordingly. Start with an hour in the garden and gradually work up to two or three hours at a time. Be mindful of your time and you will not have to turn to ibuprofen or muscle relaxants to decrease pain! Get help with heavy lifting or make more trips – Heavy lifting is one of the number one things than can hurt your back, so make more trips to your yard waste bin with lighter loads, or get help with heavy bags. Using a dolly or a wheelbarrow if you have one on hand can also help make yard waste removal easier. Hydrate well (and take in some electrolytes) – It’s easy to spend longer outside than you anticipate, and dehydration can make you feel weak, light-headed and lead to stiff tense muscles. Bring your water bottle outside and keep it on ice in an insulated bag or cooler. Add a packet of electrolyte power or a tablet like Nuun or Emergen-C to your water to replenish lost nutrients while you work. There’s no sense in having your muscles cramp up on your mid-way through your gardening time. Eat some protein – Gardening is hard work, and your muscles need protein to get stronger. Filling up on carbs and sweets will only provide a short burst of energy followed by a swift crash, so grab some jerky, a protein shake, or some quinoa for lunch. Admire your work – When you’re on a break, or when you are finished, relax outside and admire what you’ve accomplished. It’s easy to focus on how much you didn’t get done, after all, is there any real end in sight for gardening and yardwork? Admire what you have done just now, today, and be grateful to your body for what it can do. Use hydrotherapy to relieve tension/pain – Some muscle soreness is to be expected even with being as mindful and careful as you can, so rest afterwards with a heating pad or cold pack (whichever feels better, or alternate between using hot and cold) to ease away any tension. Delayed onset muscle soreness (DOMS) can occur a day or two after you have been physically active, so even if you don’t feel any tension afterwards, it doesn’t mean it won’t hit you later, so use heat on your back and hamstrings just in case. Get a massage – Did you forget to do many of the things on this list? No worries, we all overdo things at times (myself included). Schedule a massage with me, and we’ll have you feeling better in no time! Contact me today at healthyfeetnbody@gmail.com to schedule your session.